Today was an interesting day. We’ve been planning to get out and about for days now, but it hasn’t quite happened. Today went to the local beach and a market, where there was an incredibly interesting stand filled with old photographs and photographs. It felt kind of macabre, almost like sifting through the remnants of someone’s life. Still, it was intriguing. 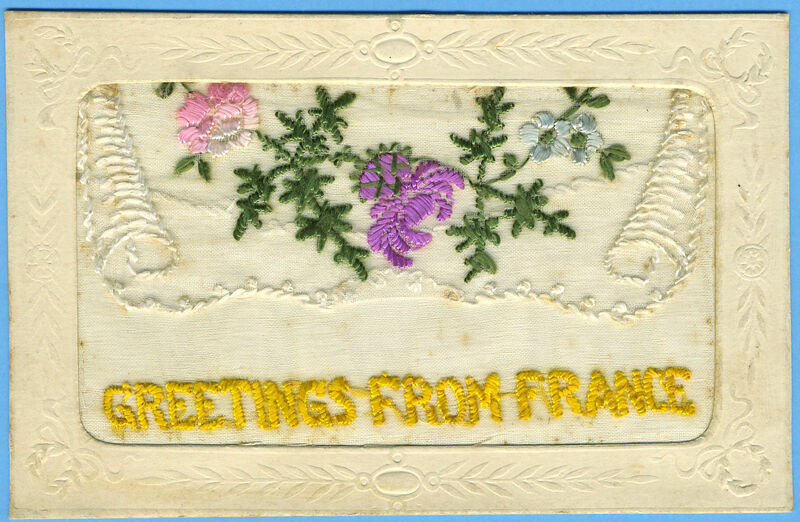 There was a little postcard with what looked like embroidery in lace on it that said ‘Greetings from France’ on and reminded me of a postcard I saw on Ancestry.com while looking up family history. It was very similar to this one that I found online, except that the scroll was instead a little envelope. Inside the envelope was a little message card, I can’t remember what that said unfortunately. Beneath that, incredibly hard to see, was the corner of a photograph – perhaps of the man in question. I can’t honestly remember if there was writing on the back but some part of me questions if there was. It was something in hindsight that might have been interesting to have but there is something oddly distasteful to holding on to the remnant’s of a young life, likely lost so far from home a century ago, when it is not your story to tell. Aside from that, it was also unpriced and I am always wary of that. Nonetheless, it was an oddly inspiring thing to find, among family photographs and what appeared to be a century-old photo album of local dogs — sadly incomplete. I don’t want to just sanitise the day out either though, into comprising of just that little moment. There was also the ice cream in that Clocktower cafe, where the chocolate sauce trickled onto my hand (oops!) and the experiment at using my new camera’s zoom to capture a bird before he darted into motion. I feel like the market is a place I might return to one day, or at the very least may gain inspiration from my visit to. It’s even given me an idea for what I might like to write while this current novel is being revised as I found the break between actual writing between Girl With A Thousand Faces and this project something that was initially difficult to overcome. Writing for the day has not yet properly begun, aside from a short outlined paragraph on Scrivener, at nearly half ten. However, there is a meteor shower which will — according to numerous websites — have it’s peak at 2am. So I have a justifiable reason to stay up tonight, do some writing and then go out and look at the stars. I’ll leave this window open for a while, just in case I do manage to capture something of beauty in the night sky and of course, as always, to share my writing progress. Eleven P.M. and I thought I’d just share my progress so far. 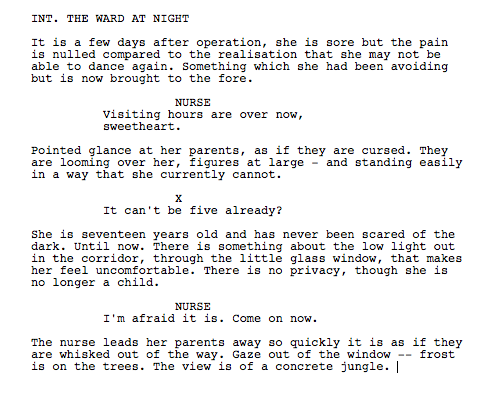 I’ve got around 300 words of a very thin outline of how the scene will start. I thought that writing on Scrivener in ‘screenplay’ form a plan simply consisting of the dialogue and some audio-visual cues might be useful but it didn’t work as I hoped. It pares down the thoughts and hopes of my character, who I want to feel is ‘real’ down to simply words on a page in the clearest way. It is not what I had hoped. I think this time I’ll be taking this little snippet I’ve got and expanding it in my trusty yellow notebook, like I did for the previous scene. It’s interesting to experiment with something new but it hasn’t quite turned out how I hoped. I’ve just noticed that I’m also using this blog to make notes of my inspiration or thoughts on how I can progress, and I thought it might be a good idea to add a figure from my own childhood, who I am simply going to call The Porter for now. It is just before midnight and I am stopping writing for now, it seems fitting to end this entry here anyway as anything after midnight is technically a new day and a new start. I managed just over three pages today as well as another realisation about the course of the story that may add a few extra scenes. This is the Storytime Scene (and yes, I am being deliberately vague as I am aware how much things may change in revisions) and I have decided to remain ‘true to life’ in the identities of some of the people nearby in the scene even if this scene is an amalgamation of different events with fiction. One minute to midnight and the longest post so far. Time waits for no man.